In this video course you will understand the assumptions, advantages, and disadvantages of various popular clustering algorithms, and then learn how to apply them to different data sets for analysis. You will apply the Latent Dirichlet Allocation algorithm to model topics, which you can use as an input for a recommendation engine just like the New York Times did. You will be using cutting-edge, nonlinear dimensionality techniques (also called manifold learning)-such as T-SNE and UMAP-and autoencoders (unsupervised deep learning) to assess and visualize the information content in a higher dimension. You will be looking at K-Means, density-based clustering, and Gaussian mixture models. You will see hierarchical clustering through bottom-up and top-down strategies. You will go from preprocessing text to recommending interesting articles. 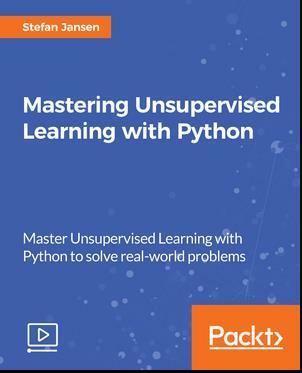 Through this course, you will learn and apply concepts needed to ensure your mastery of unsupervised algorithms in Python. By the end of this course, you will have mastered the application of Unsupervised Learning techniques and will be able to utilize them in your Data Science workflow-for instance, to extract more informative features for Supervised Learning problems. You will be able not only to interpret results but also to enhance them.